- MSM Ramps Up Calls For War With Russia - Are They Completely Oblivious Such A War Could Bring About 'Armageddon', Or, Is That What They Want? In this new story from M.D. 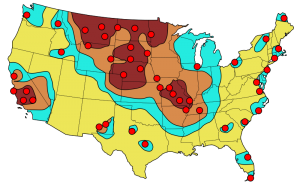 Creekmore over at the Survivalist Blog he shows us the 'US Nuclear Target Map' seen below while asking "do you live in a death zone? ", a question hundreds of millions of Americans might soon be asking if this worst case scenarios come to pass. On Saturday we offered a best case scenario of what's now happening in Syria and the Middle East, asking if we were witnessing the 'art of war' played out at the highest levels and a Trump foreign policy that will lead towards a peace agreement in the Middle East and a neutered North Korea and Kim Jong Un without Trump having to REALLY go to war. And while we'd love to believe that such a scenario were true, all across the world, the war drums are still beating. A quick reminder to those who would choose to fight it - a war against Russia could quickly lead to the end of America as we know it. Likely leading to an America without an electrical grid, an America with no banking system, an America devoid of public utilities and no transportation system as just a start, anyone who would willingly choose to fight such a war is either stupid beyond belief or actually TRYING to destroy our country. Dr Paul Craig Roberts, who served under Ronald Reagan administration, claimed the bombs would "wipe out three quarters of New York state for thousands of years”. Likely putting the lives of hundreds of millions of Americans on the line, a WW3 against Russia would easily explain why Deagel.com just raised their numbers to 262 million 'dead or gone' Americans by 2024. Do those itching for war with Russia WANT all of their family members DEAD and nearly every person they've ever known to be wiped off the face of the planet in radioactive ash or the dire famine and starvation that would be caused if Russia EMP'd us? And as one ANP reader wisely pointed out, while Deagel is forecasting a nearly a 90% population 'die off' by 2024, an EMP that took down our power grid would inevitably lead to the deaths of nearly 100% of us as our nuclear power plants go uncontrollably into melt down and deadly radiation spreads across America and the entire Northern hemisphere. 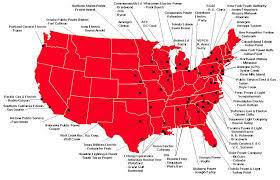 Thus, the areas seen in red in the next map below are likely much more accurate of where we don't want to be in America should WW3 begin. It would also explain why the Russia and America-hating globalists intent upon destroying both countries would be pushing for it, a WW3 between Russia and the US would lead to mutually assured destruction...which is actually the biggest hope we have that a WW3 between America and Russia will be avoided. The Russians know quite well that if a nuclear war breaks out between them and the US, the 'end times' will have arrived. And while we love to be optimistic and hope that we're watching 'de-escalation' towards global war through shrewd moves, as we see in the new stories outlined below from across the internet, more and more evidence shows we're now watching the final chess pieces of thermonuclear war being moved into their places. We've reached the point where quite literally, only one 'event' could send the entire world into a mad rush towards fiery destruction. As former Congressman Ron Paul recently stated, "they are terrified that peace is going to break out". According to Mike Cernovich, current Trump National Security Advisor H. R. McMaster is manipulating intelligence reports being given to President Trump in an effort to get 150,000 ground troops into Syria. Cernovich says McMaster is part of a coalition eager to get the US embroiled in another major war for corporate profit and as Raymond Ibrahim reported back on March 13th in this story Steve Quayle linked to on his website, there is a great deal of evidence that McMaster shares Barack Obama's views on Islam and terrorism. 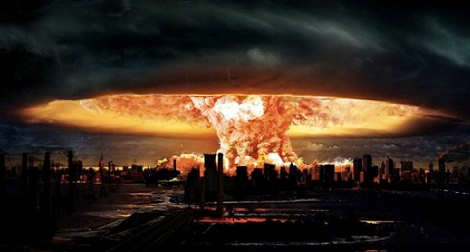 We should also remember, while most believe a nuclear war between two nuclear powers with enough nuclear weapons to destroy the entire world would be an apocalyse, 'Armageddon' is exactly what the Islamic State death cult wants. Might 'enemies of America within', 'trojan horse' holdovers from the previous administration, harbor these same horrific feelings? That possibility would certainly help explain why some would be insanely pushing for war with Russia. The military industrial complex beast Eisenhower warned us of in 1961 needs to be fed human blood. We're not the least bit surprised that Islamic terrorists ISIS immediately applauded Trump's recent bombing of Syria, joining John McCain, Lindsey Graham, Chuck Schummer, Nancy Pelosi and the international globalists in Trump's praise. Interestingly, CNN's Fareed Zakaria recently asked if the US was now acting as ISIS's Air Force by doing the bombing. 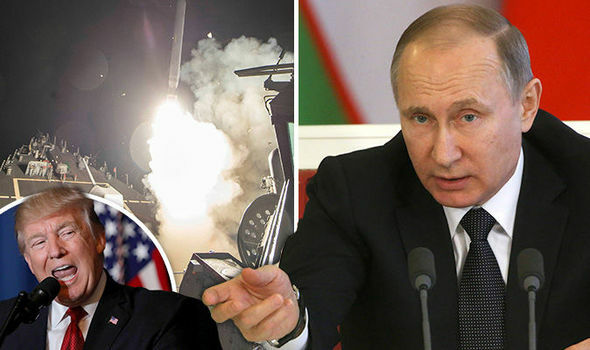 As Infowars reported on Saturday, the mainstream media in the US is gleefully calling for war with Russia, completely and totally clueless that Russia has promised time and again that such a war wouldn't be fought in faraway lands but here upon US soil. Likely leading to their deaths along with the deaths of their fathers, mothers, children, brothers, sisters, friends and co-workers, has much of the world gone completely insane by seeking war with a country that could annihilate us? In the first video below from Infowars we're given all the signs that the globalists are still in a mad rush towards all out war with Russia with the mainstream media now attacking those who doubt the 'official story'. 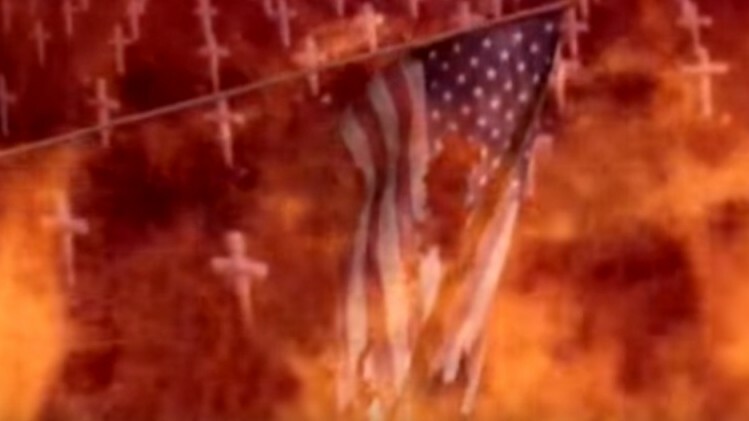 While anyone who gets their news from the MSM will get the 'official lie', anybody who's been paying attention to the endless series of lies knows better and in the 2nd video below, we see how the propaganda now being pushed by those hungry for death and destruction has been used over and over and over and over again throughout history. In the 3rd video below, Anonymous gives us their own update on the rush to WW3, warning us that one incident could very quickly lead to 'the end', much as the Russian govt recently warned, the US and Russia were only inches away from a potential WW3. With Russia recently suspending their deconfliction channel with the US that was aimed at preventing aerial incidents over Syria, there appears to be little or nothing at all in between that 'one incident' that could lead to Armageddon.